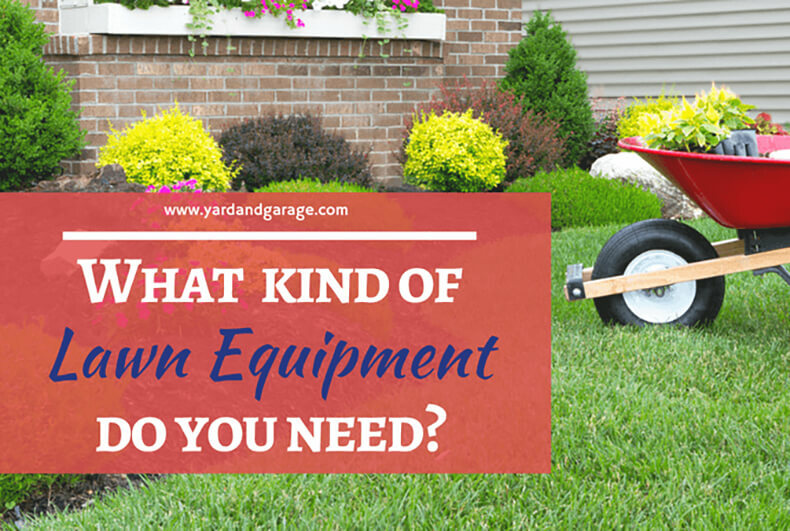 What Equipment Do You Need to Maintain Your Lawn? There is a bewildering array of lawn equipment options out there on the market for the home buyer! You can choose from traditional gas-powered lawn mowers, push mowers, string trimmers, power edgers, push-type sprayers, rakes, leaf blowers, sprayers, lawn aerators, and weed removal tools. 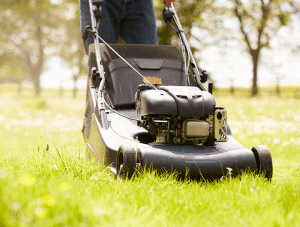 Lawn mowing equipment is the first thing most think of when it comes to maintaining a healthy, lush lawn that gives your landscaping such a beautiful and attractive appearance. How often should you cut the grass? Experts in the home and garden industry recommend mowing about once a week. That ensures you don’t cut the grass too short, which is just as detrimental as growing it out too long. A healthy lawn has a plush, ‘baseball park outfield’ look, best achieved by choosing the right mower and allowing enough time between cuttings. There are two types of lawn mowers: rotary and reel type. These are the lawn mowers you probably grew up with, producing that familiar gasoline smell and emitting large freshly chopped chunks of cut grass in rows. They work by using horizontally spinning blades that act like a razor to shear off just the tops of grass blades. Rotary mowers should be sharpened to keep those blades in top condition. They have a bagging system to collect grass clippings. These rotary mowers can be the common push type, self-propelled or walk-behind mowers, or larger ride-on mowers. If you’re tired of the gasoline smell and are looking for lawn maintenance care that’s more eco-friendly, then try the reel mower. This is a push-style mower with cylindrical rotating blades. They also shear the tops of grasses and produce cut clippings, but they don’t usually have a bagging system. Push reel mowers are growing in popularity since they have several advantages over rotary mowers. These include running quietly, zero emissions produced, and are very well suited to smaller lawns. However, they are powered exclusively by you, so aren’t best for homeowners who need a strong motor for lawn maintenance assistance. 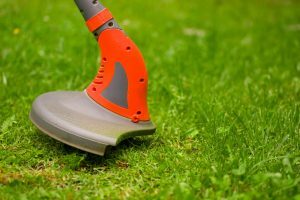 After you’ve finished cutting the grass, is it healthier to leave the clippings on the lawn or to rake them up, thus encouraging new lawn growth? It depends. Under the right conditions, those mulched clippings provide healthy nutrients and are just fine to leave them there. However, if it’s been wet or the grass was especially high, then it’s recommended you rake the clippings. An ideal way to reuse those clippings is to turn them into compost which can feed your lawn and plants nutrients. Too much dead grass can create a thick “thatch” that will block the flow of healthy air to your lawn. After your regular mowing maintenance, it’s time to take care of the grass edging around house foundations, garages, porches, and other outdoor obstacles. Grasses are related to those found in the wild around the world and can grow very tall, so you’ll want to keep them clipped. For that, you’ll need a string trimmer. Fondly nicknamed the ‘weed whacker,’ a string trimmer is a simple tool that can be either electric, gas, or battery operated. It uses high-speed revolutions of plastic twine to clip off grass edgings. Trimmers are best for smaller jobs, like trimming the edges of walkways, garden borders, fences, and flower beds. They are small enough to maneuver into areas standard mowers can’t reach. 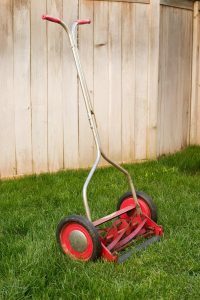 Edgers are much more powerful than simple string trimmers, and they usually feature real double-edged blades for large lawn trimming jobs. If you have thick undergrowth and heavy plant material to cut through, an edger is the heavy-duty choice. Some models can even create trenches. They create a professional clean cut look along a sidewalk, flower bed, or garden. One of the simplest, but most necessary lawn maintenance tools is the rake. Whether you purchase the plastic fan-style or a more rigid metal one, you’ll find it invaluable for gathering up leaves, lawn clippings, twigs, and other debris. Raking also acts as an aerator, stimulating the top layer of soil under the tines, and bringing more air (complete with its carbon dioxide molecules) down into the grass. Your lawn will look and be much healthier with a regular raking routine.